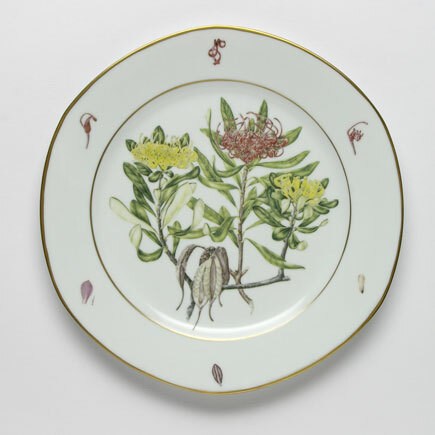 Given that so much of Flora Tasmanica’s inspiration stems from Les Blakebrough’s residency at the Royal Copenhagen Porcelain Factory in 1993 (not to mention the technical achievements that stemmed from that sojourn) it is particularly apposite that a suite of Flora Tasmanica has been given as a wedding gift to HRH Crown Prince Frederik and HRH Crown Princess Mary of Denmark by the University of Tasmania. 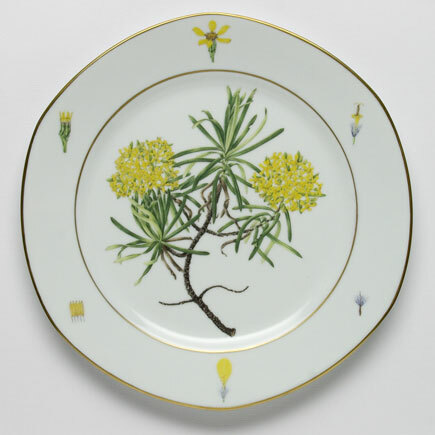 Flora Tasmanica is the product of several collaborations. 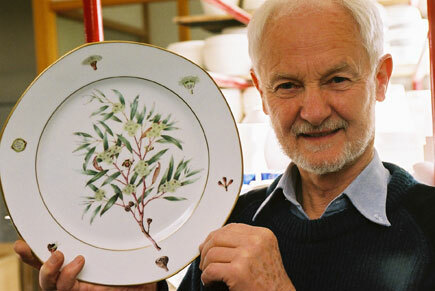 First and foremost has been the collaboration between Les Blakebrough and Lauren Black that has seen Eucalyptus coccfera (Tasmanian Snow Peppermint), Euciyphia lucida (Tasmanian Leatherwood), Brachyglottis brunonis (Tree Senecio), Nathofagus gunni (Deciduous Beech), Lomatia tasmanica (King’s Lomatia) and the Telopea truncata (Tasmanian Waratah) searched out, recorded in their natural habitats, and then worked up as scaled botanical illustrations by Lauren Black; following the image development, it has been Les Blakebrough’s task to produce the finished plates with their accurate representations of the original paintings. Each of the editioned plates has been designed to be displayed on a wall but they also come packaged in a beautifully formed wooden box designed by the furniture designer, Peter Costello. The box serves a twofold purpose: on the one hand it provides a secure means of transporting and storing the platters; on the other hand, the inside of the box has been used to provide a lyrical account of each of these rare plant species written by the Tasmanian-based botanist, Alan Gray. 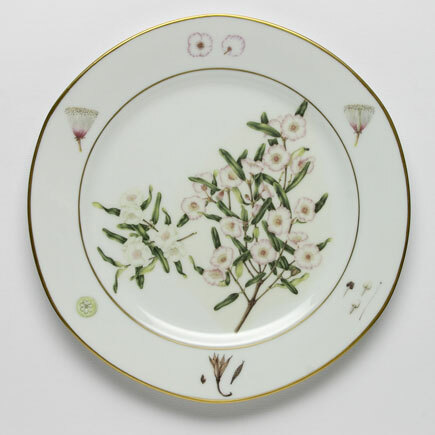 Renowned graphic designer, Lynda Warner has been responsible for designing the graphic elements of the project including the textual information that appears on the bases of the plates. 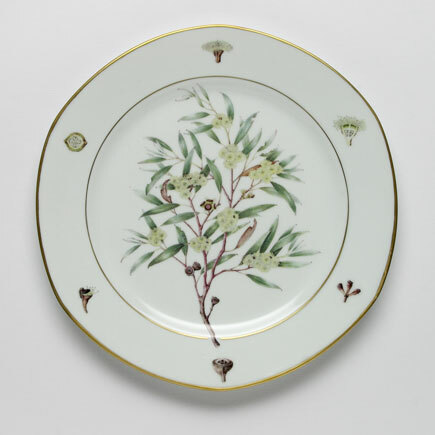 This exhibition sees the completion of the project with the launch of the final platter, Telopea truncata (Tasmanian Waratah). This unique and very rare plant belongs to the same family as the Waratah and the Banksia. It is found only in one small locality, in rain forest on the Bathurst Range, near Cox Bight in far south western Tasmania. The late C. D. (“Deny”) King, a local tin miner, discovered the plant there in 1965 and it was subsequently named and described by Winifred M. Curtis in 1967. King’s Lomatia is a small spindly tree or sparsely branched shrub to about 3-5 m tall. The dark green, shining, compound leaves are lobed and somewhat prickly toothed and bear some resemblance to the leaves of a Holly plant. The flowers are borne in loose or dense racemes at the tips of the branches and consist of four curved petal-like segments which are usually a rich crimson or burgundy in colour; each segment bears a yellow anther and the four segments together enclose an embryonic fruit. The fruits are astounding as no seed is ever set thus the plant is effectively sterile. The plant spreads or renews itself by a system of rhizomes and suckers, or by the thin branches leaning to the ground, thereby forming a layering process. Genetic studies and other research strongly suggest that this lone population is but one plant – a clone – and has been perpetuating itself for at least the past 43,600 years. If so, this is probably the oldest living plant on Earth. King’s Lomatia has been horticulturally propagated but the plants thus produced rarely live long. It is considered to be critically endangered, the chief threats to its existence being fire or soil borne diseases. This is a rare, shrubby daisy which is confined to only two known localities in Southern Tasmania, Mts Wellington and Dromedary, the two separated by the River Derwent. It is found on rocky slopes in sub-montane shrubberies, usually on rough boulder slopes between 650 – 1000m in altitude. The plants may be from 2 – 4m high with the narrow, glossy leaves crowded in bunches at the ends of the numerous branches. Some specimens are neatly pyramidal, others rather more straggling. The newer leaves are sticky-resinous and when bruised emit a fairly strong aroma, some likening the smell to that of Friar’s Balsam. The small, bright yellow “daisy” flowers are borne in about late November to January each year. They are usually not spread evenly over the entire shrub, but are massed in a patchwork of large clusters, contrasting sharply with the green of the leaves. When in flower the plants are easily recognisable in the shrubbery alongside the Mt Wellington Pinnacle Rd., from about The Springs to the Chalet. The seeds are wind-borne and, being so easily distributed, it is puzzling as to why the species is not much more widely occurring. It is listed as Rare under Schedule 5 of the Tasmanian Threatened Species Protection Act, 1995. There are approximately twelve other species of Brachyglottis, all of which occur only in New Zealand. Telopea truncata – Tasmanian Waratah. The name Telopea is from the Greek and literally means “seen from a great distance”. The bright crimson to scarlet flowers of this plant contrast vividly with the dark green of the foliage and the generally sombre backdrop of the sub-montane forests and shrubberies in which it mostly occurs. The waratah belongs to the Banksia and Grevillea family – Family Proteaceae. It is confined to Tasmania where it is quite common on most mountain sides, in wetter areas. There are about four other species of Telopea, found in Victoria and New South ‘Wales, The New South Wales species T speciosissima is perhaps the most spectacular: indeed, it is that State’s floral emblem! Each waratah “flower” is actually a tight bunch of 20-30 small, individual florets, packed into a dense head, 60-100mm across, rather in the form of a truncated cone, hence the specific name. Each floret produces copious nectar. The fruiting follicles that follow very much resemble miniature “stalked” bananas in bunches. The follicles turn from bright yellow to brown before splitting along one side to release numerous winged seeds. Whilst the bright red forms are the most common, there is also a form with bright yellow flower heads, ranging from a dusky to bright canary yellow in hue, and always a surprise and a delight to encounter growing amongst its red relatives. This remarkable shrub or small tree is found only in the highlands of western Tasmania. It is the only cold adapted winter-deciduous plant occurring in Australia. Most commonly it is a small to medium shrub of crooked and twisted appearance. It usually forms a small trunk with widely spreading and often closely intertwined branches which form nearly impenetrable thickets. Hence the alternative common name “Tanglefoot”. In summer, the bright green leaves are distinctive. Rounded or somewhat ovate in shape, and with the veins deeply and evenly impressed on the upper surface, their vibrant green stands out amongst the duller more subdued green tones of other sub-montane vegetation. 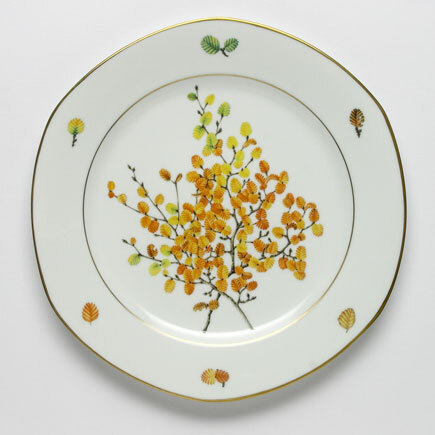 At the onset of our southern autumn, in April to May, the leaves begin changing colour, usually from delicate shades of lemon yellow to a rich burnished orange. A few may take on a rich crimson hue. The fall of the leaves often coincides with a late autumn snowfall. The sight of the coloured leaves sprinkled on the snow like confetti, is unforgettable. Nothofagus gunnii was named in honour of Robert Campbell Gunn, a 19th century Tasmanian plant collector who roamed over much of Tasmania including Mt Olympus, near Lake St Clair, where the first collection of this exquisite little plant was made. This fine and famous tree forms an important component of the Tasmanian rainforest vegetation, usually in association with the Tasmanian myrtle beech and sassafras. Leatherwood occurs from sea level to sub-montane levels. At lower elevations the tree may reach 30 to 40 metres and, as altitude increases, a more dwarf form is more common. In late spring, through summer, the trees produce masses of large white flowers with four petals and very numerous stamens; the whole flower may be up to 4cm in diameter, forming a spectacular contrast with the deep green, oblong leaves. The flowers produce copious amounts of nectar and it is for this reason the leatherwood is famous. Bees produce a distinctly flavoured dark honey from the nectar and this honey is an economically important export for Tasmania. The pink-flowered form is very rare in the wild. 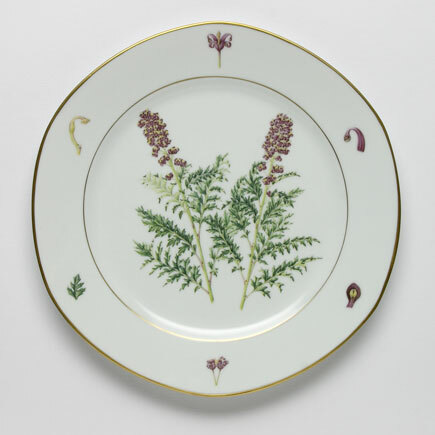 The picture on the plate is from a horticultural cultivar, first collected from the wild and given the name “Ballerina”. Eucalyptus coccifera -Tasmanian Snow Peppermint. Found on the slopes and summit of Mount Wellington, the Tasmanian Snow Peppermint is widespread in plateau country throughout much of Tasmania. It is regarded as an alpine tree, and usually flowers from late spring into summer. At the lower limits of its altitudinal range Euaclyptus coccfera is a fine tree up to 40 metres tall. With increasing exposure to fierce weather above the snow line, the trees become stunted and are finally reduced to small, almost prostrate shrubs. The greatest development of the species occurs on mountains at altitudes above 1500 metres, where on bolder slopes of dolerite the trees form pure stands. In such situations climatic conditions are severe, and it is not unusual to see leaves and branches encased in ice. A distinguishing feature of Euclyptus coccfera, clearly visible on the plate, is the small curl at the end of leaves.